Your AgEdNet.com subscription includes many PowerPoints. 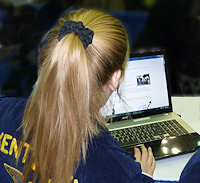 A PowerPoint reviews the main ideas from a lesson. Here are some questions and answers related to PowerPoints. How can I print PowerPoint slides without the colored backgrounds? The problem: Some students want to print copies of the PowerPoint, but don't need the fancy backgrounds and colors. The answer: When your PowerPoint is open, choose "Print," and then under the "color" tab, choose "pure black and white." The background is not included, but the text is there and the photos are shown in black and white. The PowerPoint looks like an outline. Where are the photos and text? The problem: Rather than the text and photos you expect, you see text boxes that say, "Click to edit Master title style" or something similar. The answer: the PowerPoint has opened in the "Master View." Use the red "X" at the top of the screen to "Close Master View." Or use the "View" tab and choose "Normal." There is no PowerPoint for a particular lesson. The problem: The AgEdNet.com lesson you are studying does not have a PowerPoint. The answer: While we would like to have PowerPoints for all lessons, some lesson material is more difficult to adapt to the PowerPoint format. Sometimes we cannot locate the specific photographs or cannot contain the copyright permission we need to use photos for a certain lesson topic. If you have a specific request or if you have photos we could use for a certain topic, send us a note through our contact us page. The problem: When opening some Microsoft Office documents like PowerPoints and Word worksheets, you may be asked to choose to "Open" or "Save" the file. The "Open" option does not work. The answer: If the "Open" option does not work, try the "Save" option.